Get a group of women together — around a kitchen table, out on the town, or in a secluded camp in the backcountry — and there’s no doubt everyone will have a good time. 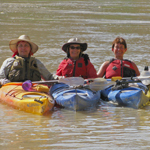 One of our most experienced guides says the best thing about guiding women only river trips is the sound of women laughing. Small giggles and outbursts of hilarity ... the river canyon picks up the sound and carries it downriver, along with stresses and worries about daily life. 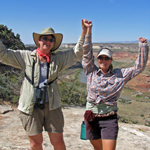 Sheri Griffith River Expeditions’ women’s vacations offer so much to an individual. They’re relaxing and rewarding in ways you’ll never imagine. It’s an incredible opportunity to bond with women in an atmosphere of fun, adventure, challenge and mutual trust. If you’ve never experienced Utah river rafting before, this is the perfect chance to do something women don't do often enough ... play in the outdoors! No camping skills are necessary. You’ll be amazed at the camaraderie that develops in days or hours, and the experiences you never thought you’d have in a lifetime. Utah’s stunning red rock canyons and the flowing rivers that carve them are the perfect setting for women-only Colorado River rafting. Our women-only trips are led by professional female guides who are eager to share their passion for this country and its way of life. Let your guard down and focus on yourself in one of the most beautiful places on earth! The whitewater is heart pounding. The slower river sections offer spectacular scenery to quiet the soul. The ancient Indian history and geology educate the questing mind. The star-sprinkled night skies evoke thought and earnest appreciation for our place on earth. The activities are ever-changing: River rafting, exploring, hiking, swimming and sunbathing. Any day, you can do it all. “(The Guides) were all great. Did you keep the best for this trip…or are they all so good at their jobs? By the time we reached the rapids everyone knew the guides were very skilled." 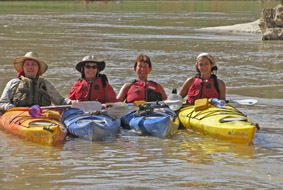 5 day Cataract Canyon on the Colorado River — Oarboats are the perfect vehicle to see Canyonlands National Park up close. Listen to the quiet dipping of the oars as you journey through the famous confluence, where the Green River’s brilliant green waters swirl into the Colorado’s rushing red flows. You’ll face the whitewater of Big Drops and Santan’s Gut rapids, stopping each evening alongside the river on vast sandy beaches. There’s time for hikes into lush side canyons each day. A classic Utah river rafting experience. 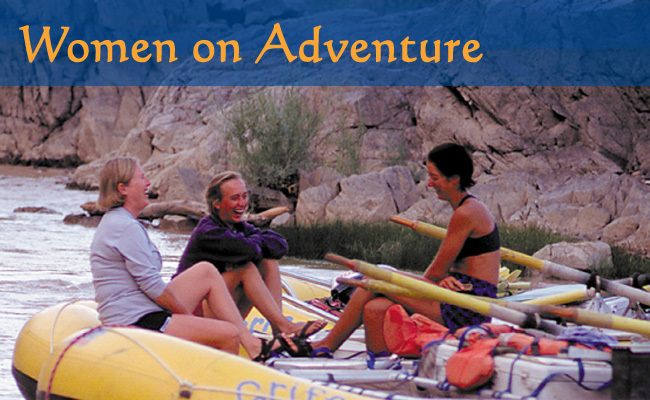 5 day: Labyrinth Canyon Sea Kayaking Tour This great adventure allows women to explore on their own, yet still come together as a group as we traverse the winding Green River through this beautiful desert canyon. Page Lambert's 5 day Westwater Canyon Writing Journey Details on this trip have yet to be determined. Call us for more information!